Cambridge Carbon Capture is a potential spin-out from the Department of Materials Science. The team are developing a highly-efficient process for power-production and carbon sequestration that can convert fossil fuel and industrial waste materials directly into clean electricity and various valuable chemical products. Conventional carbon capture and geological storage processes are expected to increase electricity costs by as much as 30%. 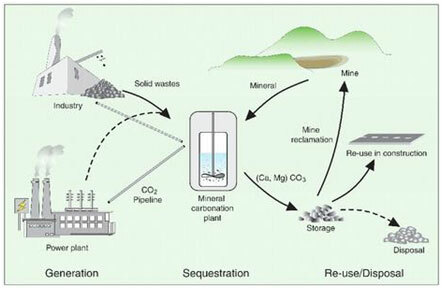 In contrast, the new mineralisation process generates high value chemicals and carbonate minerals, uses up existing industrial waste materials, and releases about 15% more energy than comparable processes that release CO2. As a result, electricity generated in this way may actually be cheaper than current-day fossil fuel electricity generation. In the short term, the first adopters of this process are expected to be companies which produce significant calcium or magnesium-containing waste products (for example in the mineral mining, construction materials and chemicals sectors) or companies looking for alternative manufacturing methods for carbonate-based products. For these companies the disposal of waste materials and the production of new materials are the main economic factors, and the electricity and carbon-sequestration are useful by-products. The task for the i-Teams is to identify the most attractive initial market opportunities and potential commercial partners for the process, to enable Cambridge Carbon Capture to build and demonstrate its first small-scale CO2 mineralisation plants.